New Construction East Nashville Home!!! Hey East Nashville dwellers and dreamers — we are welcoming a new construction property to the Maplewood heights neighborhood this week! 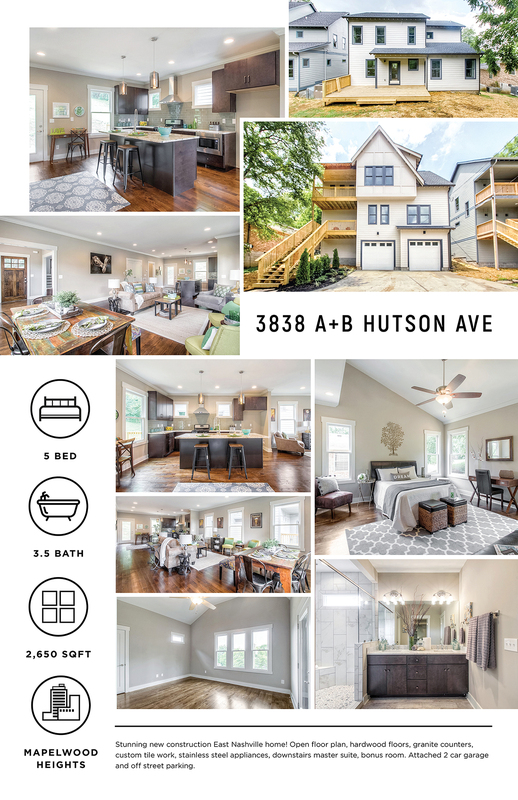 Located at 3838 Hutson Ave, this new construction home boasts gorgeous custom finishes, on a spacious lot. Enter through the beautiful front door into an open floor plan with gorgeous hardwood floors and ample natural light. See straight back into the kitchen from the living area, which has a beautiful light colored granite countertops, ceramic glass backsplash, large kitchen island with bar seating area, and high-end stainless steel appliances. This is the perfect home for entertaining, or for lounging around and spending quality family time. The master is located on the main level. The room is large enough for a king size bed, and ample seating area. The master bathroom finishes are fit for a king and queen! His and Her sinks with marble counters and large marble shower, with a separate toilet room, and connects to the massive walk in closet. Upstairs you’ll find the same quality craftsmanship and finishes, with 4 additional bedrooms and 2 full bathrooms, plus a laundry closet. The home boasts a 2 car garage, off street parking, 2 front covered decks, and a back porch on a large treed in lot. If you’re looking to move to East Nashville, don’t miss out on this incredible brand new home!!! Contact us at 615.807.0579 today to get more information, or click here to see more homes in the area.